DON’T HURT THE COUNTRY STORE : Charles Martin, the government affairs director for the Vermont Chamber of Commerce, said 80 percent of his member businesses are 20 or fewer employees and will have trouble paying $15 an hour. MONTPELIER —The Housing and Military Affairs Committee continues to hear from business owners and advocates who say that a $15 minimum wage is simply unaffordable for their organizations. 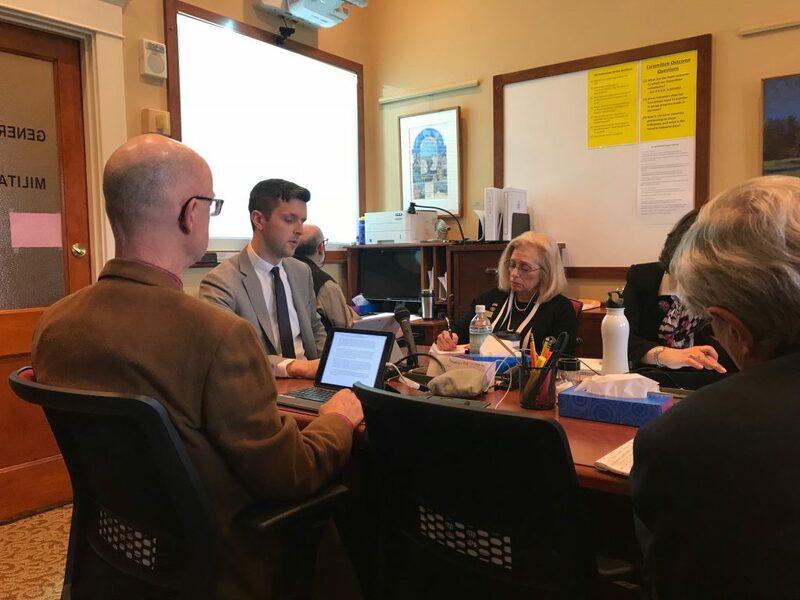 Speakers giving testimony Wednesday included Coleen Kohaut, a nursing home administrator at Franklin County Rehabilitation; Jill Charbonneau, president of the Vermont AFL-CIO; and Charles Martin, government affairs director for the Vermont Chamber of Commerce. Kohaut and Martin spoke against raising the minimum wage to $15 an hour by 2024, the current proposal of S.23. Charbonneau was in favor of the wage increase. Kohaut, who is a native Vermonter and second-generation business owner, noted that pay and benefits account for 54 percent of her budget. She said paying the higher wage would be unsustainable. “Unfortunately we do not have the ability to absorb this kind of increase in our payroll without making significant reductions elsewhere,” she said. Those reductions, deemed necessary to keep the business afloat, would potentially apply to current employees. Coleen Kohaut, a nursing home administrator at Franklin County Rehabilitation, said her organization might not be capable of paying workers a $15 minimum wage. She noted Vermont has limited workforce availability. About 57 percent of Kohaut’s patients are Medicaid recipients, 22 percent are self-pay or private, and 21 percent are in Medicare. That’s important, she noted, because Medicaid and Medicare are substantially underpaying for services. “I would love to pay a higher wage, but all I ask for is, if you do this, you need to make sure that there has to be a balance, and you are gonna have to pay for it on the Medicaid side,” she said. Charbonneau, whose union represents the interests of the labor movement, said she sees a $15 wage as necessary to help people struggling to meet their needs. She said the wage policy shows how much the state cares for its more vulnerable workers. “The reality is that we are the richest nation on earth, and how we care for our elderly, and how we care for our children, and how we care for people who suffer from opioid addiction is telling, and we need to do a better job,” she said. Rep. Lisa Hango, R-Berkshire, asked Charbonneau what she thought of the previous testimony from Kohaut, especially with regard to the limited reimbursements that they are given from these big organizations like Medicaid. Charbonneau responded that the state is just going to have to put more money into the reimbursements. She suggested there will be new revenues available for this. Martin, whose work with the Vermont Chamber of Commerce keeps him up on business trends, said he knows firsthand how tight budgets can be based on his own family’s experience running a small country store. Martin challenged some of the popular conceptions put forth by proponents of a mandatory wage increase. “I’ve heard a few people say, ‘A lot of businesses will be able to sustain these increases.’ I deduce that means a lot of businesses won’t be able to sustain these increases, and I ask this committee to observe that,” he said. He also addressed the claim that businesses won’t suffer any competitive disadvantages from a higher minimum since all companies would have to play by the same rules. “I tend to agree with that rhetoric, but I also ask people to see that that means we would be at a competitive disadvantage regionally and nationally, because we would be the state with the higher minimum wage,” Martin said. Rep. Thomas Stevens, D-Waterbury and the chair of the committee, acknowledged that the issue is complex. “One of the things that makes this difficult is we hear this story and then we hear the stories from an employee’s perspective that says it’s really difficult to make ends meet with this current minimum wage,” he said. So one of the parasites in the Assembly says “144,000 Vermonters make less than $27,000” according to tax filings. I’d wager that nearly all of them are living mostly on Social Security which results in zero to negligible TAXABLE income. The people who appear to be making less than $15/hr are students working part time and people who don’t report their income from tips. Never mind the adverse economic impact on small businesses affected by arbitrarily raising the minimum wage. The justification for doing so is, of course, that ‘once a low wage earner – always a low wage earner’. And the only way to elevate one’s station in life is to elect government officials who will choose the wage deemed appropriate, despite one’s ability or need. Economist Thomas Sowell pointed out that in a free market Americans are constantly moving out of their income brackets. 97% of the people in the bottom 20% of wage earners elevated their status out of the bottom cohort, by their own fruition, in 8 years or less. In fact, within 8 years, more of those low wage earners moved to the top 20% than stayed in the bottom cohort. Here are some more statistics. 12% of Americans will find themselves in the top 1% of wage earners for at least one year at some point time during their lives. 39% of Americans will be in the top 5%. And 56% will be in the top 10%. I repeat: more than half of the American workforce will find themselves in the top 10% of wage earners at some point time. Of course, under socialist tenants, 100% will always be in the top 10% of wage earners…. ….or in the bottom 10%, depending on one’s perspective. And, under socialism, only government officials will determine what that wage should be. The Dem/Prog/Lib pay little attention to what the folks on the firing line have to say. Once their mind is made up, it’s don’t bather me with facts and don’t be surprised if $15 minimum wage becomes a reality next year then they’ll have to up the anti from $10,000 to replace those who have flled. The $58K must include the government employees (I refer them as being employees–not workers). I believe the $27K is more realistic. Out of 625K population 144K is almost 1/4 of the population. The people on welfare isn’t included—their numbers? Conclusion, yup $58K are employees of one of the biggest state government in the country per cap. This is simply another tax on private business to the benefit of the spenders in Montpelier. Given that many businesses in VT are operating on marginal overhead and now they will have to endure additional financial pressures by the golden dome dictatorship. It’s a feel good matter to the elite. 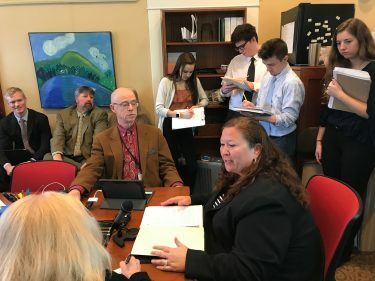 What will happen, the worker gets the Montpelier wage increase, then they will have to pay extra taxes to VT and the Feds. Many publications show that this increase to $15 actually reduces their take home pay. Furthermore, businesses will move out of state or fold, reducing the jobs available in VT. In VT there’s not many potential workers skilled enough to hold a job or have the desire. Many employers have to “school” them for the work. I’ve talked to many business guys that said they hire such people and shortly they don’t show up for work. Good workers are a premium and scarce. The elite don’t have a clue. I’ve had an engineering business for 26 years and I’ll be damn if a politician will tell me what I’m going to do. I schooled myself, financed, hired, had many up & downs, long hours and scarifies. Businesses have cycles. Screw you Montpelier. You wouldn’t have gotten a tax increase from me, I did have choices. What once was termed the “Now Generation” has become the “Right Now Generation”. Deferred gratification is now deemed unacceptable, thanks to media (Lifestyles of the Rich and Famous, extreme example). Yes, BS Sanders plays his part in fomenting the dissent. Local, state, and federal policies toward business also play larger part. It is virtually impossible to have a healthy economic environment when efforts to create wealth are stymied by laws and regulations that impede the growth necessary. Skills acquisition and improvement also becomes a joke when there’s no job available to implement those skills. Technology enters the picture, viz increasing use of robotics: The current brouhaha at Stop & Shop south of the border in Massachusetts is the first thing today comes to my mind where robots are currently displacing humans in doing the routine maintenance and inventory stuff previously done by actual people. Disgusting Pre-packaged meats, deli- items, produce are also coming on the scene. Larger examples: Walmart, Costco, Amazon. Human labor is being gradually nudged to obscurity. Huxley’s Brave New World; we’re just now getting the “Soma”– legalized pot. etc., to keep the proles sedated and stupid. It’s not just Vermont; the entire world is changing, for better or worse. Duh you doofus.. I think it’s 1000’s of feet over the heads of all you leftarded incompetents. If it’s not written out completely in Big letters in the leftist handbook your lost. How about looking to states/cities that have implimented your stupid 15 per hr min wage. Most all will show a loss of jobs and business for the effort. The higher minimum wage is essential to the Progressive goal of preventing the unskilled workers from finding employment. Large numbers of unemployed, disaffected and easily indoctrinated government dependent youth are essential to Democrat voting numbers. The Trump administration’s low unemployment is devastating to their election chances. Coups don’t happen in high employment countries. The fantasy they promote is that low wages always affect an unfortunate percentage of the population which overlooks that it isn’t the same people year after year, it’s just people who are entering the labor force and haven’t yet acquired marketable skills. Keeping the unskilled out of the labor force insures they stay unskilled and unemployable at the mandated higher rate. Rep Thomas Stevens….. so lets expose his outright lie and propaganda, his statement above..
Everybody who is employed has to be paid minimum wage. If they work less than 40 hours…..they don’t average the same yearly pay as somebody who works 40 hours. $11 per hour = $22k per year. $7.50 = $15,000 per year, which was our minimum wage decades ago. Our current minimum wage is higher than 96.7% of all pay in the entire WORLD. Vermont’s problem is Montpelier, Montpelier makes things too expensive. We could have home ownership on our current minimum wage, Vermont will not allow these homes to be built, it’s that simple. Vermont and all it’s programs, that keep people poor, are pay checks and good ole boy deals that make many very, very wealthy. The fact that this man is the chair and has zero grasp of reality is frightening. He seems pretty competent and carrying DNC water though, just don’t think! Well he could be looking at the tax returns for small business owners that are struggling too, notice he talks tax returns. These people are devious. The other issue is, a tax return doesn’t differentiate between full time and part time. If you have someone who is making 27k/year but is only working part time (20 hrs/week) that’s $26/hr. Where I work there are tons of folks who work part time but are making over $20/hr. You office space where you work out of is taxed at a different rate then the rest of your home for property tax implications. How Vt makes it so difficult. is out of Business !! iPhone free workspace………Oh wait, that would mean I’m a Liberal Snowflake …..NO Thanks. Bernie promised, he’s going to make it come true! Everybody in a socialist country makes great money Bernie said it, it’s got to be true! Stop saying this, it’s starting to make me melt!